So you’ve decided to treat your cat to a fancy new cat tree for her to enjoy climbing, scratching and lounging upon. You excitedly rush home with the new offering only to have her ignore the new cat tree in favor of the box it came in. The tree sits there unused while Fluffy continues to sharpen her claws on the corner of your sofa. Sound familiar? 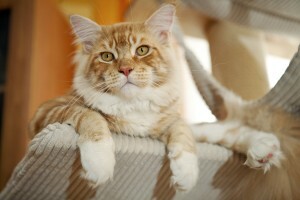 Luckily, there are some things you can do to entice your cat to use that new cat tree. Cats love to stretch out vertically when scratching and climbing, and need a sturdy post that can withstand their acrobatics and energetic scratching; besides being a safety hazard, few cats will use a wobbly cat tree. Make sure the tree is tall enough for your cat to really stretch out—for most cats, the taller the better! If you have the space, try to get a cat tree with lots of different platforms, levels and sleeping nooks. Also, cats have different preferences when it comes to scratching surfaces whether it be sisal, carpet, wood, or corrugated cardboard. Choosing a tree covered in the material your cat prefers will increase your odds of success. If you put the cat tree in an empty corner of the house that you never frequent, why should your cat go there? Cats like to be where the action is. Observe the areas in which your cat enjoys spending time, and try to place the tree in one of those locations. Often this will be near a window, and the cat tree will only enhance your cat’s outdoor viewing opportunities. Don’t just place the new tree somewhere and expect your cat to figure it out by herself. While some cats might get the hang of it immediately, for others a proper introduction will go a long way towards generating some excitement and interest in the new furniture. Use treats, toys or catnip to entice your cat onto the tree. If your cat responds to catnip, sprinkle it generously on the cat tree. Hide your cat’s favorite treats on various levels of the tree, or dangle a favorite toy just high enough that your cat needs to climb the tree to reach the toy. Give your cat lots of praise and positive reinforcement when she spends time on the tree.